Well over 80 Freemasons attended the installation meeting of Dr David Ian Harrison as WM of the Lodge of Lights No 148 at Warrington Masonic Hall. The installing master, Gwilym Jones, carried out a faultless ceremony under the direction of Eric Delamere, director of ceremonies. Kevin Poynton (left) congratulating David. The lodge was opened by Gwilym and the normal administration duties undertaken. Gwilym announced that since the last meeting Walter Parton PPrGSuptWks had passed to the grand lodge above. Gwilym provided a eulogy highlighting Walter’s Masonic career, concluding by requesting that everyone should stand in silence as a mark of respect to departed merit. 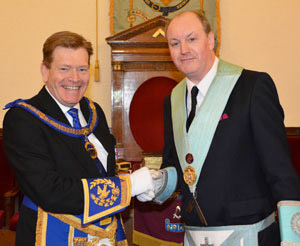 Eric Delamere entered the lodge and reported that the principal guest, Assistant Provincial Grand Master Kevin Poynton was without and demanded admission. Gwilym said we would be very pleased to receive him. Kevin, along with grand and Provincial grand officers were admitted. Grand officers present included Dennis Rudd, Jack Forsyth, Gordon Amos, Stan Churm, David Redhead and Derek Hunt accompanied by Les Savage, Howard Savage, David Marlor and Chris Gleave, group vice chairman. Gwilym offered a very warm welcome to Kevin and all the grand officers, Provincial grand officers and visiting brethren and hoped everyone would have an enjoyable evening. Gwilym, as a matter of procedure and as a mark of respect offered Kevin the gavel, which on this occasion he was delighted to accept and then handed it back saying he felt confident that it was in the best hands. Pictured: Over 80 enjoyed the social board. Gwilym requested the assistance of John Belton by occupying the SW chair, Dave Woods the JW chair and Ian Jackson by acting as IG. All the brethren agreed, saying they would be honoured. The master elect David, was then presented to the installing master as a candidate, to receive at his hand the benefit of installation and the presenting officers were John Gregory and Stan Churm, being David’s proposer and seconder. David was then installed into the chair of King Solomon according to ancient custom with all reverence and humility. David took his obligation on a Bible dated 1599 and it is said to have been the Bible on which Alias Ashmole took his obligation when he joined Freemasonry in 1646 in Warrington. Kevin congratulated David on being installed in the chair of such a fine and old lodge. He continued by thanking Gwilym for all the hard work he had done over the last 12 months and particularly in the tercentenary year. Picture left: David (third from the left) taking wine with his personal guests. Picture right: David (left) being toasted by Gwilym during the Master’s song. Kevin continued by saying he was also delighted to bring the congratulations and good wishes of the Provincial Grand Master Tony Harrison. Kevin passed on his personal good wishes to David, his officers and all the brethren, for a happy and successful year. He congratulated Eric for his work undertaken during the ceremony. Following the ceremony Kevin was presented with cheques to be forwarded to various Masonic and non-Masonic charities including: Warrington General Hospital Special Baby Unit £100, Headway £100, Brookfield School for special needs children £100, Warrington Disability Living Centre £100, St Rocco’s Hospice £100, Francis House Children’s Hospice £150, The Walton Lea Project £150, The Christie Charity £100, Masonic Charity Foundation 2021 Festival £1,500, West Lancashire. Masonic charities £700, Warrington Masonic Hall £400, Ecclesholme £400 and Rachael Main for (Fire Service Peru Project) £100. This resulted in a grand total of £4,000. On behalf of the recipients Kevin thanked the brethren for their magnificent donations totalling £4,000, commenting on the tremendous amount of money being spread across so many important beneficiaries. He went on to congratulate the brethren on their foresight in selecting the charities to support and the tremendous amount of work required to donate so much in 12 months. 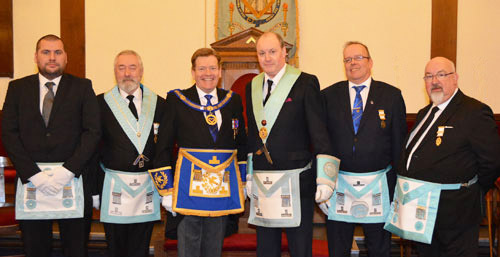 Pictured from left to right, are: Peter Range, Peter Barton, Kevin Poynton, David Harrison, Quentin Newall and Rev Canon Michael Finlay. The presentations of the working tools were carried out by Peter Range third degree, Alan Ellis second degree and Danny Wheatley first degree. The address to the WM was expertly delivered by John Gregory and the address to the wardens by Keith Dickinson. Kevin delivered the address to the brethren in an exemplary manner. David was born in 1970 and gained his PhD 10 years ago from the University of Liverpool on ‘The origins and development of Freemasonry’. He is a history lecturer and author of nine books on the history of Freemasonry. He was initiated in 1998 into Domville Lodge No 4647 in the Province of Cheshire and due to work commitments moved to the Toxteth Lodge No 1356 in 2003 and later in 2012 he joined the Lodge of Lights in the Province of West Lancashire. He has lectured across the continent of Europe and in the USA and Canada on the subject of Masonic History and its origins. The guests and members enjoyed an excellent four course festive board and the normal hospitality of the Masonic hall. The gastronomic delights included a fresh fruit platter, cod mornay, roast beef with Yorkshire pudding with roast potatoes and chef’s freshly cooked vegetables and chocolate profiteroles. Red and white wine complemented the meal which was followed by tea or coffee. Lodge of Lights’ ladies and guests enjoy a meal together. The master’s song was sung by Gwilym Jones, accompanied by Keith Dickinson. Kevin responded to the toast to grand officers and commented on the magnificent donations of £4,000 to charity. He continued by saying he was delighted to see so many grand officers in attendance and thanked them for their support. He praised the publicity team for heightening the profile of the Warrington Group. Finally, Kevin thanked Les Savage, Howard Savage and David Marlor, acting Provincial grand officers, for their attendance and support. Kevin and Chris were presented with bouquets of flowers on behalf of the lodge. They both thanked the WM and brethren for the flowers and a most enjoyable evening, saying they hoped the lodge would have an enjoyable and productive year. The most pleasurable evening was brought to a close by the tyler’s toast offered by Ray Illingworth. 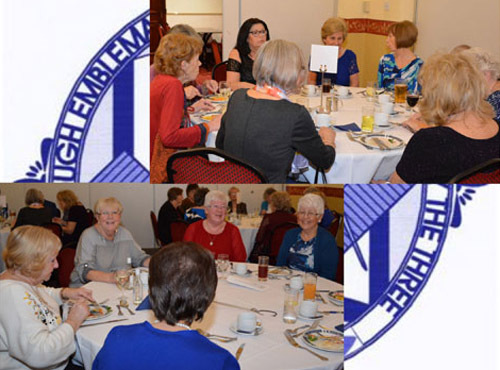 The Lodge of Lights’ ladies and their friends also met in an adjacent room and enjoyed a meal together. Pictures and story by John Starkey. Pictured from left to right, are: David Marlor, Chris Gleave, Stan Churm, Kevin Poynton, David Harrison, Gwilym Jones, Gordon Amos, Les Savage and Howard Savage.